We also stock tools 1 & 2 with a 12mm shank for European collet sizes – let us know if you require this size. Straight router #40 grit, 12.7mm diameter shaft, 10mm diameter cutting head. Straight router #70/80 grit, 12.7mm diameter shaft, 13mm diameter cutting head. Drainer groove finishing tool #70/80 grit 12.7mm diameter shaft. Used to smooth out the groove produced by tool 4. 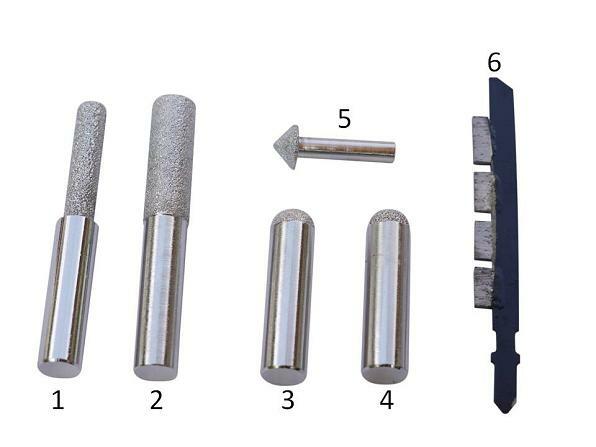 Drainer groove cutting tool #40 grit 12.7mm diameter shaft. Used to cut the drainer groove. Bevel cutting cone 6.35mm diameter shaft. For reproducing the fine edge bevel. Jigsaw Blade 4 segment metal bonded diamond. Use wet with no yaw action. The full set comprises one of each of the above items. Item BBCT8 listed below is a straight router that is very aggressive at #20/30, this is designed more for CNC machinery than hand held routers.